Happy Flash Friday everyone! 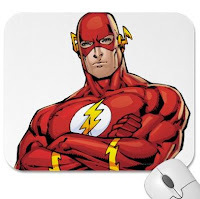 Over the past Flash Friday articles I’ve talked a lot about Flash merchandise. From shirts to phone covers we’ve covered a lot of ground. Today I’m going to talk about all those things and even more. Zazzle is one of those websites that creates items on demand. Want a specific picture on a coffee cup? In a few clicks and some money and they’ll make it and send it to you. When they first got the DC license they had a handful of Justice League designs, but nothing with just the Flash. Since then they’ve added a few things. There are now 36 images just in the Flash category. Some of these are symbols, some are logos, and some are characters. There are a lot of images to choose from. Once you’ve picked the image you want you have to pick something to put it on. Zazzle offers different types of shirts, a few types of mugs, pins, stickers, mouse pads, skate board decks, hats, aprons, key chains, magnets, greeting cards, stamps, binders, and phone covers. The only real limitation is that a lot of the items have a white background, so if your perfect item needs to be bright red you will probably be disappointed. I’ve ordered things from print on demand shops before. I was always a little disappointed with the shirts, but the other items were quite good. It’s very possible that the shirt process has improved greatly. Unfortunately I can’t review the quality of the Zazzle items, I haven’t put in an order yet. 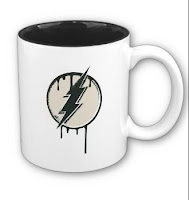 I will be ordering the coffee mug you see pictured above. I won’t be ordering the mouse pad. Just look at the picture. He just looks so disapproving, it’s like he already knows the websites I’m going to go to and he’s disappointed in me. I don’t need that kind of pressure while I’m online. Stop being a stick-in-the-mud, Barry! All your friends visit those sites when you're not looking! Lia, your comment just made my day. And considering I spend my Saturdays stuck at work, that means a lot.